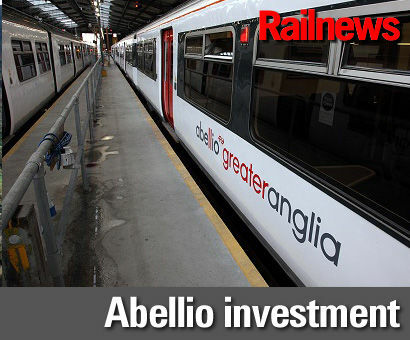 ABELLIO has unveiled further investment in Greater Anglia, just two days after it became known that its joint bidder Stagecoach was pulling out of the competition for the next franchise. Abellio said it would invest a further £3.5 million in service improvements, which meant that it would have spent more than £40 million on service upgrades during its present short contract, which began in July last year and runs until October 2016. Some of the extra money will go into an interior refresh of another 10 Class 317 units, while there will also be extra funds for improving general fleet reliability and cleanliness as well as better on-train announcement systems. Some stations will also benefit from minor works such as the replacement of clocks and repainting. AGA managing director Jamie Burles said: "We have now more than doubled the investment we announced at the start of our short franchise in 2014, with over £40 million now being spent. Despite two short franchises we have been fully focused on delivering short term improvements as well as helping to secure the long term investment that our region's rail network deserves. We know there is more to do to achieve the quality and consistency of service our customers rightly expect and we will keep on doing all we can." Abellio had said that it will be continuing with its bid for the next Greater Anglia franchise, even though its former partner Stagecoach Group pulled out two days ago after a failure to come to terms. Stagecoach said: "We have been unable to reach an agreement with Abellio on elements of the proposed bid. As a result of that, and taking account of the other rail bidding opportunities that we anticipate over the next two years, we have decided not to proceed with an equity participation in the bid for the new East Anglia franchise. "We have confirmed to Abellio our commitment to provide support and advice to the franchise if Abellio's bid is successful." Abellio responded by saying that it would be going on alone to compete against the other two shortlisted bidders, FirstGroup and National Express. Abellio said the Department for Transport had been informed. A spokesman added: "Abellio UK will now continue to finalise its bid and feels it represents a compelling proposal." The joint venture with Stagecoach had been shortlisted by the DfT on 2 June.